When the olives are almost mature and picked by hand from the trees they are crushed by simple mechanical cold pressing (without chemical extraction with the use of solvents) and, without any other handling, the oil that is produced is of the «extra virgin» kind. Natural and genuine oil with an acidity that never exceeds 0.8%. This makes it very easy to digest, and ideal for the most delicate of organisms like those of the elderly or children. Let us try and understand a little more about extra virgin olive oil. There is a difference between an extra virgin olive oil and an olive oil, an olive oil that can be made from refined oil and virgin olive oil and so on. Make sure you recognise them and always read the labels, even of products in oil which are eaten and claim to be “with olive oil”! The oil produced by our farm is exclusively Extra virgin Olive Oil which not only respects the parameters of the category but presents excellent values which are also translated into tasting appreciation by the consumers. If on one side a product can have the characteristics to be declared such according to the law, it is another that within its category that product reserves highly appreciable sensorial characteristics. “Extra virgin olive oil” is the name given to the oil obtained from the first pressing of the olives using mechanical processes, hence without resorting to processes or chemical substances, in conditions which do not alter the oil. The free acidity of the oil, expressed in oleic acid, is not greater than 0.8%. 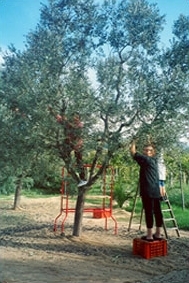 Only prime quality olives that have been picked and pressed are used. They must not have undergone other treatment apart from washing, separation of the leaves, centrifugation and filtration. The recognised quality of extra virgin olive oils is in fact the result of two different types of investigation: on one side, the chemical-physical analyses, to determine the real composition in percentage terms of fat and acidic level, on the other, the organoleptic exam which judges the visual and olfactory characteristics and taste of the oil and assesses its strengths and weaknesses. Definitions of olive oils pursuant to art. 35 of reg. CE 1513/2001 dated 23rd July 2001. Extra virgin olive oil: oil with a perfect taste and an organoleptic score equal to or greater than 6.5; its free acidity, expressed in oleic acid, is lower than 0.8 g per 100 g and it has other characteristics that conform to those required for this category. Virgin olive oil: oil with a perfect taste and an organoleptic score equal to or greater than 5.5; its free acidity, expressed in oleic acid, is lower than 2% (2 g per 100 g) and it has other characteristics that conform to those required for this category. Ordinary virgin olive oil: good tasting olive oil with an organoleptic score equal to or greater than 3.5; its free, acidity expressed in oleic acid, is at most 3.3% and it has other characteristics that conform to those required for this category. Lampant virgin olive oil: oil with an imperfect taste and an organoleptic score greater than 3.5; its free acidity, expressed in oleic acid, is greater than 3.3% and it has other characteristics that conform to those required for this category. Refined olive oil: it is olive oil obtained by refining virgin olive oils; its free acidity, expressed in oleic acid, cannot be greater than 0.3 g per 100 g and it has other characteristics that conform to those required for this category. Olive oil: is the olive oil obtained by a portion of refined olive oil with virgin olive oils; its free acidity, expressed in oleic acid, is lower than 1% and it has other characteristics that conform to those required for this category. Crude olive pomace oil: oil obtained by extraction with solvent from the olive pomace with any mix of oils of another nature. It has characteristics that conform to those required for this category. Refined olive pomace oil: oil obtained from refining crude olive pomace oil. Its free acidity, expressed in oleic acid, must be lower than 0.3 g per 100 g and it has other characteristics that conform to those required for this category. Olive pomace oil: oil obtained from a portion of olive pomace oil refined with virgin olive oils other than lampant oil; its free acidity, expressed in oleic acid, must not be greater than 1 g per 100g and it has other characteristics that conform to those required for this category.